Did you know that 74% of all internet traffic is video, but only 4% of Realtors use any form of video to help them sell properties? 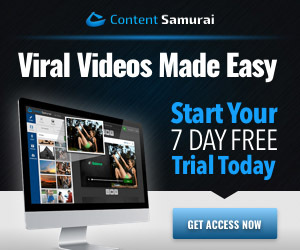 To help Realtors profit from this insane amount of video traffic, the team behind the online video creation tool Content Samurai have just released a brand new Property Template! The new template will create high-quality Real Estate videos for you with just a few clicks of your mouse…all you have to do is paste in the listing text and upload your images and Content Samurai’s intelligent video creation engine will handle all of the hard work! The new template is perfect for anyone working in the real estate field, as it means you can now quickly and easily create videos for ALL of the houses you’re trying to sell. If you’re a freelancer or digital agency, this is a great opportunity to build up a solid business by creating videos for Realtors – as they need ongoing videos when they list new properties each week! Realtors usually aren’t tech savvy and regularly pay upwards of $200 for a single listing video, so it can be a profitable side business for you! To help you take advantage of this new opportunity, the team at Content Samurai have put together a short video that shows you exactly how to create a professional property listing video with a few clicks of your mouse! You can also try the new template for free, so in 5 minutes from now you could have your first listing video – how amazing is that! By the way, I love the new Property Template, and I’ve modified slightly it for use in creating marketing videos for other products.